Technological advances in cloud computing is changing how businesses are operating. Not only are we becoming more digital; but we are also becoming more agile. Meaning, employees can work from the comfort of their homes whilst remaining fully productive, efficient and resourced. This poses its own set of risks on a number of fronts, some of which are easily controllable. By implementing these simple steps, you can drastically improve your ability to control sensitive data securely. Monitoring the behaviour of remote workers is extremely difficult and relies largely on trust. This can be quite a leap of faith when you believe in somebody to safeguard your business. Theft of data often isn’t on the forefront of an employee’s minds and an overly trusting nature at home can lead to disastrous results. The risks in a corporate office are just as present in the home office. Rummaging through your bins and sweeping around your house will lead to a costly Data Protection breaches. So, how can we ensure security procedures are being met at home and not just in the office? There is no way of entirely securing a home - it will always be the weakest link in your security. But you can still drastically combat the threats by making policies easy to follow. Training staff to fully understand and appreciate the value of information destruction will help motivate, inspire and equip you team members. This step is crucial to making your staff take ownership of security. Ensure a small safe is installed into every home office. This will allow employees to store confidential data which needs to be preserved. Preventing access from the opportunist theft will drastically reduce threats of a Data Protection breach. Personal data in your bin is already at threat, let alone business waste. It is vital we are all shredding our paper and complying with the law. 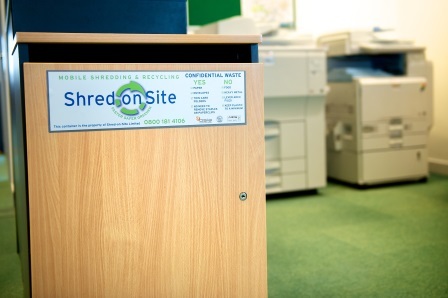 Document destruction specialists like Shred-on-Site will install a paper shredding receptacle– as found here http://www.shredonsite.co.uk/Why-Shred/Paper-Shredding-Receptacles. These lockable containers securely collect confidential data before being retrieved and destroyed on site by trained, experienced and vetted staff. This relieves the pressure on employees to spend valuable time paper shredding; releasing them to focus on other work. The key to pairing remote working and Data Protection is simplicity. Making the procedures easy and efficient, will improve the standard of security and motivate staff to abide by the stipulated guidelines. I hope this article has helped and please leave your comments and suggestions below.